Isaac Brenya is a passionate green entrepreneur with a BSc in Development Planning from the University for Development Studies, Ghana. He works closely with other entrepreneurs in the green or climate-related ecosystem. 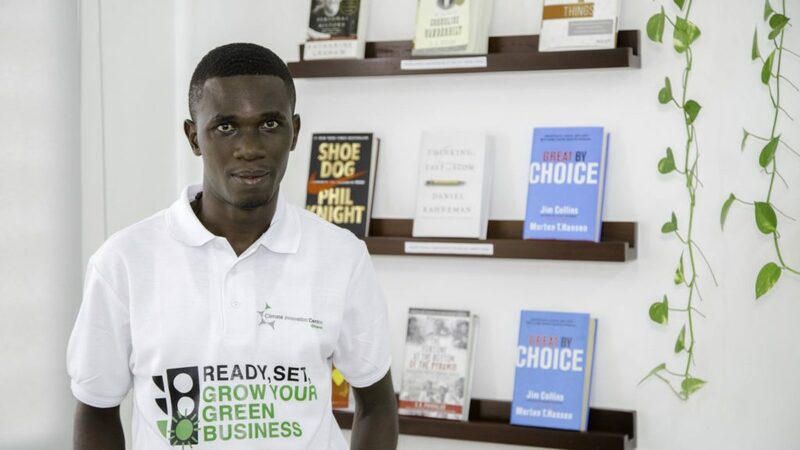 As a green entrepreneur, Isaac has participated and been shortlisted into the finals of many green competitions including Switch Africa Green Starter 2016, Adansonia project 2016, and Seed Awards 2017. He was also one of 49 candidates in Africa to be shortlisted from 350 submissions to the SAG-SEED Awards 2017. Ecovon is a green start-up that focuses on utilizing and turning waste into sustainable building materials. Ecovon is rethinking and re-designing how a new generation of building materials are made by developing sustainably sourced, newly engineered formaldehyde-free bio-based wood alternative made from coconut husk and sugar cane bagasse. This innovative technology positions Ecovon as the first manufacturer of non-additive, bio-based, renewable wood products in the local Ghanaian market.